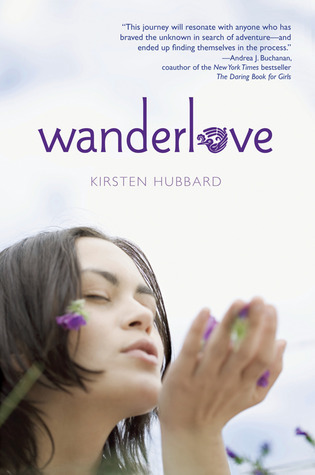 Wanderlove by Kirsten Hubbard. Delacorte Press, 2012. Currently available. Face Value: This cover is ok. I’m not enthralled with the dreamy blowing-flowers-into-the-air situation, but at least we see a real girl’s face. The spine of the book has a small photo of two backpackers and the back cover has a beach photo, which gives it more of a travel feel. I don’t know what I’m looking for (not a map background, certainly), but I wish we could get some more of that travel novel vibe from the front cover. It’s the ever-changing settings that make this book enchanting, and I want that represented in the cover. Does it break the slate? Yes, it does. It’s not an earth shattering Slatebreaking story because Bria is slow to evolve. With most slow moving characters, I get annoyed, but Bria was different. I cheered for her every step of the way as she inched along to confidence and independence. Who would we give it to? First time solo travelers. I’ve traveled a little, but never completely on my own. Reading this book made me want to embark on my own “just me” trip because I was inspired by Bria’s eventual success. Review: It’s getting cold around here, and my busy work schedule has me longing for escape. It was time for a travel novel. One set in a warm climate. Wanderlove was the perfect balm for my seasonal malaise. Nothing in Bria’s life is going as it should. Her best friends pull out of their post-graduation travel plans. Her grand art school plans go awry when her artist boyfriend demolishes her work, dumps her, and announces that he’s going to a better school. She goes numb. Bria is unable to move forward with her life plans because she just doesn’t know what she wants anymore. She stops drawing. Since art is what feeds her soul, she starts to wither. In a moment of desperation, she decides to sign up for a tour group trip to Central America. Bria regrets her decision as soon as she meets her tour group. She’s the youngest traveler by at least a decade. She feels like such a dork as her tour guide reprimands the travelers for delaying the itinerary even an iota. In a moment of boldness and possibly insanity, she goes off with a group of backpackers and ditches her tour group for good. Her trip changes radically, and so does she. As she backpacks through Central America with her new companion Rowan, Bria must discard a lot of baggage (literal and figurative). She learns to travel light, and to travel smart. She works through the crud she’s still toting around from her ex-boyfriend. And she finally begins to draw again. It’s a liberating journey for Bria. She learns to see the world in a different way and to engage with culture in a way that traveling with a tour group never would have allowed. Of course, this isn’t just an upward and onward story. There’s a great deal of steamy tension between Bria and Rowan as they travel. They insist that they’re just travel siblings. No funny business, just experiencing the world together. Right…like that will work. It’s a testament to Hubbard’s writing that there was any sexual tension at all when it was glaringly obvious that they would get together from the very first moment the characters met. The book has a pleasantly slow build up to the romantic peak. As Bria and Rowan circle each other cautiously, Hubbard is careful to peel the layers from each of their personalities. We learn about their foibles and quirks, understanding that love will be challenging for these two…but it will be absolutely worth it. Other than the romance, this book is glorious in its descriptions of settings. Bria’s joy at her newfound ability to independently explore gave me chills. Because Bria is so grateful to be out in the world, she describes the Central American locations with a certain kind of love. Hubbard has experience as a travel writer, and her sensory descriptions of the places and sounds and tastes are amazing. I don’t even like mangoes very much, yet I found myself craving them after reading about Bria’s travels. What I appreciated most about Bria as a Slatebreaker is that she is an example of how we can grow beyond our previous stupid choices. Sure, Bria had let a boyfriend rule her life and eventually break her heart. But she’s done with that now. She won’t do that again. Even the most confident and independent women have moments of self-doubt. Bria is gradually minimizing those moments and finding more moments of pride in herself. I find that more inspirational than anything any nonfiction self help book could teach. This entry was posted in Reviews, Young Adult and tagged backpacking, Central America, Romance, travel. Bookmark the permalink.